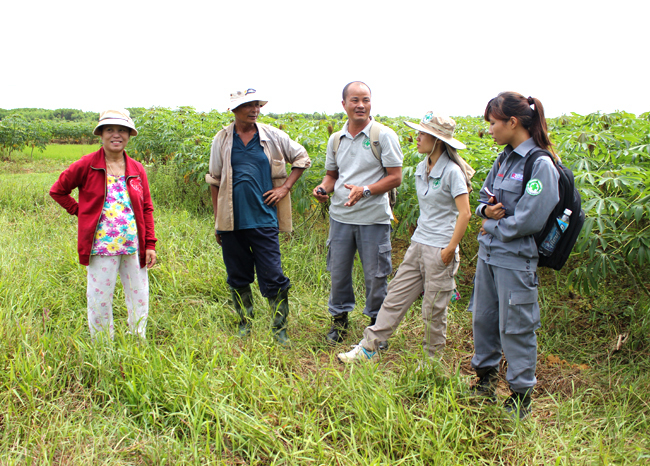 Hai Lang, Quang Tri (17 July 2015) – A cluster bomb found in a cassava field on Friday prompted quick action by a RENEW team that resulted in destruction of the ordnance less than an hour later. 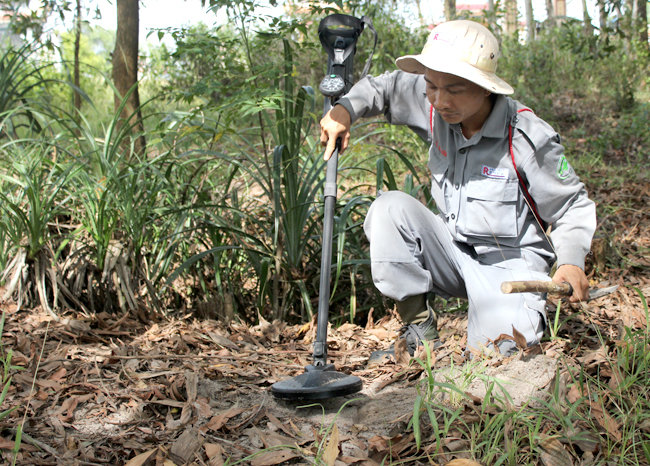 RENEW/NPA’s Non-Technical Survey (NTS) Team was working in the area of Mai Dan Village in Hai Lam Commune. As part of the Team’s household interview plan to collect UXO-related information, NTS team member Tran Thi Xuan visited the family of Mr. Le Sam who reported that he had unearthed a cluster bomb while tending cassava. Xuan and the 65-year-old villager immediately went to the site, within minutes Xuan had contacted RENEW’s EOD team which was dispatched to the site, and half an hour after the team arrived and a large bang was heard throughout the area. Mr. Sam’s family and his neighbors knew the deadly weapon was now safely destroyed. This recently introduced RENEW/NPA approach to systematically cleaning up unexploded ordnance is starting to show positive results. The NTS teams conduct desk studies and village meeting and collect valuable information from local residents that lead to exact sites of dangerous ordnance. This “evidence-based” approach is then followed by sweeps of the area using tested methodology that is specific to cluster bombs strikes. A pattern or “footprint” is determined quickly and followed by cleanup of the ordnance found and, ultimately, when all ordnance in the area has been destroyed, the team informs local residents that the area is now safe for normal activities. This approach has proved to be faster, more efficient and very cost-effective, and a reliable assurance of safety for local people. For that reason, funding from the U.S. Department of State has increased significantly. 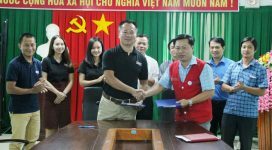 With a new grant from U.S. DoS, $3.5 million for the first year of a possible five-year project, RENEW/NPA teams for the first time are tasked to cover the entire province of Quang Tri. According to 65-year-old Mr. Sam, a lifelong village resident here, this area was fiercely bombarded, especially with cluster bombs. During wartime, it was a stronghold of a regiment of the People’s Army of Viet Nam (PAVN or North Vietnamese Army). Sam insisted that unexploded cluster bombs have remained buried in the fields over the years or have moved around because of floods. The land has not been cleared yet, but local villagers still take the risk and grow rice and cassava. At another house, interviewing Ms. Ho Thi Thanh, a 55-year-old native of Mai Dan Village, NTS team members learned that she had encountered two cluster bombs while hoeing her land six years ago. Fortunately, the munitions didn’t explode. At that time, she carefully buried them and since then has not dared to do anything more. She showed the team the site, a parcel of land about 250 m² full of wild grass, adjacent to the place where Mr. Sam unearthed a cluster bomb the day before. “Local villagers have farmed the land for many years,” said NTS Team Leader Nguyen Duc Hoa. “When they find cluster bombs they put them in bamboo stand that surrounds the field, and go back to their work. People are afraid of cluster bombs but they have to work to make their living,” he said. Hoa said the ones who have not been killed or injured when moving ordnance around have been very lucky, because the items are very dangerous. 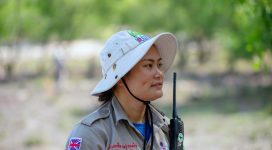 According to RENEW/NPA Operations Manager Nguyen Thi Dieu Linh, EOD spot task information provided by local people in villages such as Mai Dan provide the evidence needed by RENEW/NPA to trigger deployment of a technical survey team and a plan of action. The Cluster Munitions Remnants Survey (CMRS) method, based on an investigative search process, permits the CMRS team to define the hazard accurately and generate a Confirmed Hazardous Area (CHA). “CHAs generated are migrated to the Database Unit (DBU) of the Provincial Legacies of War Coordination Center (LWCC),” said Linh. “The LWCC then tasks available clearance NGOs to clean up those CHAs. For example, Mines Advisory Group (MAG) teams have been clearing CHAs generated by RENEW/NPA teams since March 2014,” she said. Linh said this kind of cooperation among NGOs is now reaching a new stage of effectiveness and efficiency. So far RENEW/NPA’s CMRS teams have surveyed 58.5 million m² in four districts of Hai Lang, Trieu Phong, Cam Lo and Dakrong, resulting in 322 CHAs consisting of 7.8 million m² being identified. In the process, 4,057 cluster bombs and other munitions have been safely destroyed. Comprised of 13 pairs of non-technical surveyors, RENEW/NPA NTS Team in the past three years have visited 12,425 households with a total population of 60,718 residents. UXO-related findings from NTS Teams have resulted in 2,860 EOD spot tasks conducted by EOD teams and safe destruction of 6,936 items of UXO. 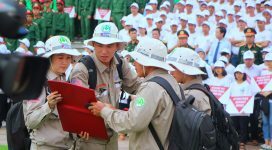 With support from Norwegian People’s Aid (NPA), the provincial government of Quang Tri recently established the LWCC to coordinate all post-war mitigation efforts involving NGOs and government agencies.